Nevertheless, what James appears to have discovered, is certainly compelling enough to swirl the odd eyebrow, or two - particularly, as in any event, there are without doubt, several more items on the #PipesWatch checklist still waiting to be located and confirmed. So, with that in mind, and evoking Parky's ominous opening monologue... Let's see what you think. And incidentally, we shall be using the 101 Films DVD for time-codes, if you'd like to investigate further, yourself. 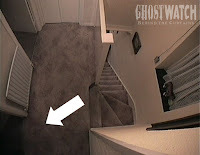 Firstly, James reported that he could see the faint outline of a figure to the left of Pam Early, during this shot taken at the rear of the property (you can see the Hallowe'en decorations in the kitchen, and hallway behind Suzanne). "NOTE: IN THE DARKNESS OF THE KITCHEN WINDOW THERE IS AN INDISTINCT IMAGE - PERHAPS MERELY A STRAY REFLECTION - BUT WE GLIMPSE A STRANGE STATIC FIGURE WITH A RED LIGHT LIKE AN EYE. However, MRS EARLY moves forward, obscuring the figure and when she leans back, it is gone." Something also worth noting here, is that the production schedule for this particular date of filming (Thursday 30th July) also lists Keith Ferrari as being required for this very shot. 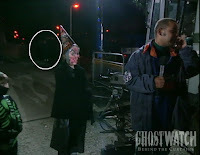 However, even when digitally enhanced (short of using our very own light-pen on the screen, there), this sighting has long-remained frustratingly inconclusive - despite there undoubtedly appearing to be something resembling a 'figure' between Craig, Kim and Pam. 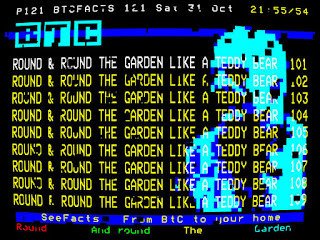 But now, thanks to word just in, from director, Lesley Manning, we can exclusively reveal that actor, Keith Ferrari is indeed behind the patio glass, during this shot, bringing the confirmed total up to nine! 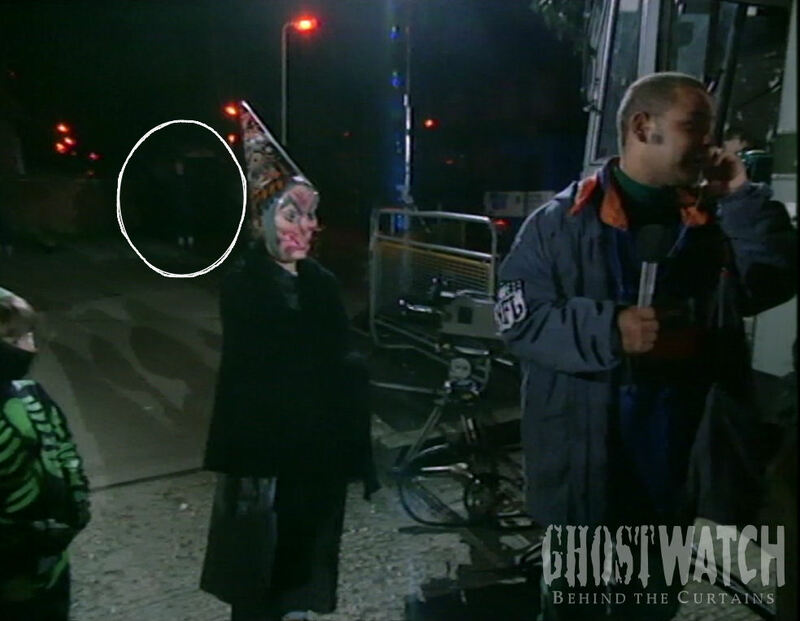 And just for the record, this marks the first confirmed new sighting, since 11 June 2000, via Stephen Freestone's inaugural fan-site, ghostwatch.info. Around the same time transmission cuts out, and the image switches to Craig speaking with Alan Demescu about how 'calm and peaceful' the interior of the house appears to be, James has noticed somebody stepping in and out of the shadows, in the background. Now, personally, I wouldn't figure Pipes for what very much appears to be a pair of white socks/sneakers, but the motion of this person does seem rather interesting. It's almost as if they are intentionally moving in and out of the light, for some reason. 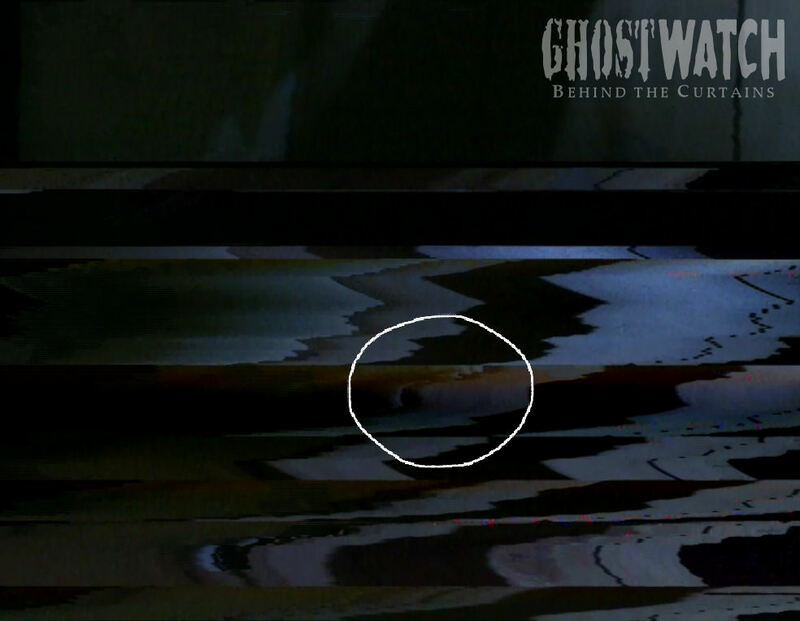 Also, at this point in the narrative, despite the fact that Pipes *should* be in the Glory Hole with Suzanne - as James rightly points out, throughout the film, the ghost is seemingly able to manifest at various locations... Hmm. Answers on a postcard, please? 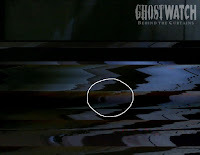 James has spookily suggested that teeth, nostrils, and even an eye socket can be found amidst the static of this shot, possibly from some kind of overlay - similar to the otherwise confirmed seventh sighting, during the film's windswept denouement. Now, this one is undeniable, and another great spot, by James. 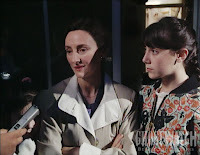 After Suzanne becomes trapped in the Glory Hole - just moments before the live feed turns to static, and the various, interior camera angles are cycled by the Gallery - there is an unmistakable flutter in the corner of this shot of the landing, overlooking the children's bedroom. Now, one likely explanation, is that this is simply a clip from some earlier point in the film, which happened to include a few stray frames featuring one of the cast or crew. My first thought, was that it was either Mike Aiton or Chris Miller from when everyone rushes into the bedroom, only to find Suzanne covered in scratches. Or even, Sarah as she later scours each of the upstairs rooms to try and find the missing Kimmy. However, neither of these seems to match up. Consequently, this too, remains something of a mystery. Who, or indeed, what are we seeing, here? 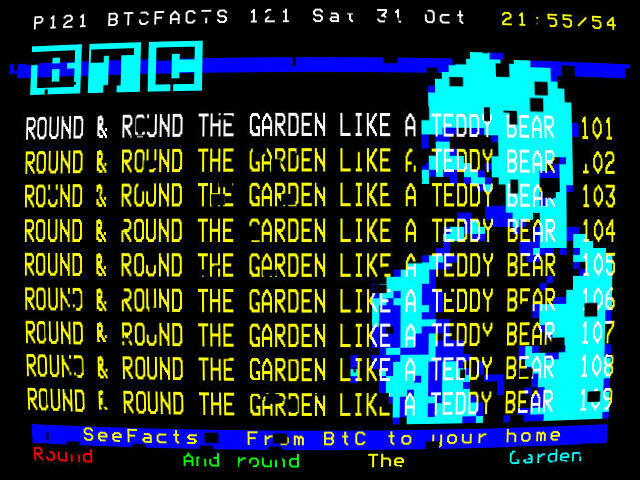 In any event, I can't recall this being mentioned before now, so kudos again to James for spotting it! 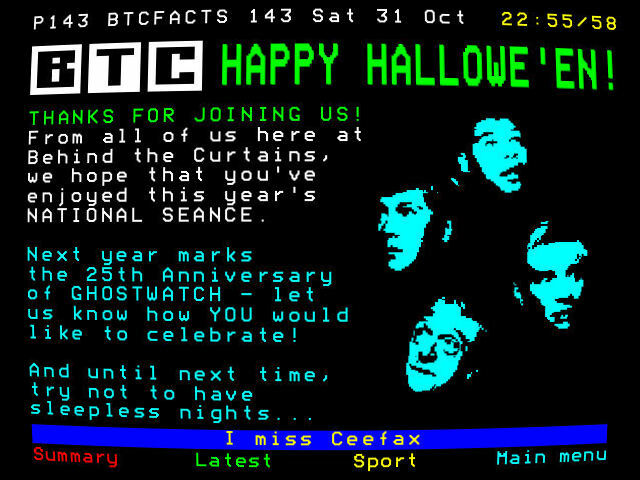 Once again, if you were able to find anything of interest in the above, or at any point during Ghostwatch whatsoever, do get in touch with your time-codes, and we'll have a good look at it. And don't forget to leave a full description of what you thought you saw with somebody manning the phones, please. Oh, we before we sign off, a huge thanks to everyone who helped make National Séance 2016 such a memorable evening, this year! Particularly, As I Gather, We Were Trending On Twitter, Again. Analytics are slightly thinner on the ground, this time around, but at least 31,000 impressions alone were recorded in the short space of 24 hours via the @Ghostwatch account. So, the chances are, we ranked somewhere in the Top 20 on the night, at the very least. Bravo, Pipes-Phobes! We're also delighted to report that Behind the Curtains placed among the best performing titles in BBC Store's new Frightmares collection, also featuring in the top ten best sellers, for the first two weeks after launch! Blimey. Now, you'll have to excuse me, as I'm a little busy working on something usable but terribly important to look especially striking. Ahem.